Like you the heel and gusset but more with dread as mine rarely looks this good. Those are so pretty - love all the colors in them. And, yes, each time I knit a sock the heel turn seems like magic to me - love it! I'm still learning to make the gusset area neater...but I do believe I'm getting better at it. Practice!! I feel the same as you. The heel turn and gusset are so simple but they seem like magic. I never would have thought I would enjoy knitting socks like I do. I also know that a lot of people absolutely have to have matching socks. When you’re wearing them no one notices anyway! Ha! This is very pretty yarn and it looks Christmasy to me. It does look like gingerbread man. Wow, these look fantastic! Great job with the socks. I love the whole sock knit; from magic of casting on toe-up to the, to heel turns and then the home run of the leg-a perfect knit every time! I love your gingerbread socks. 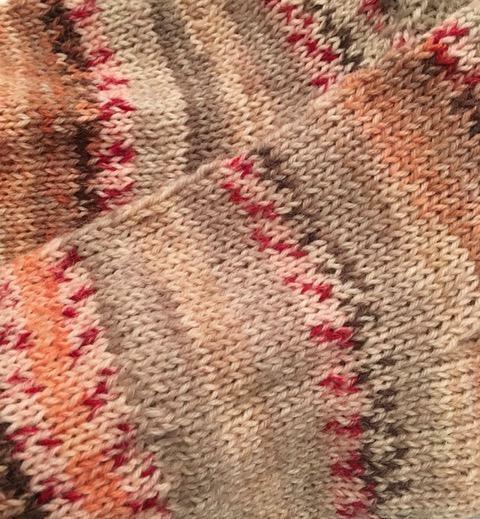 I take a big breath every time I start the gusset. I think this is because lately I seem to be making more errors and have been doing uneven decreases. This last pair is better, I'm not gusseting while distracted. hehe. They turned out very cute. My favorite part is going down the foot in a stockinette stitch. 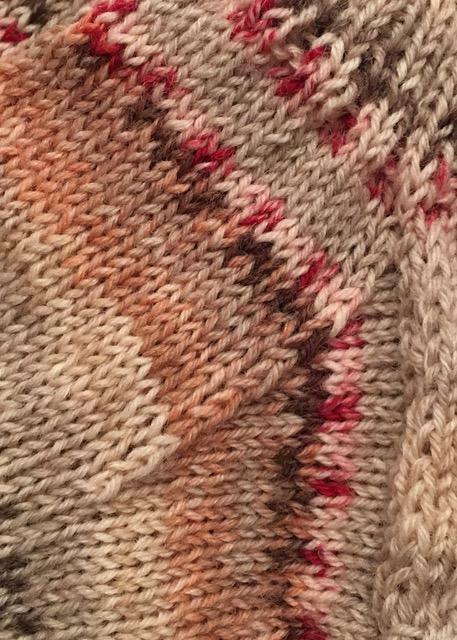 My least favorite part --- the first few rows of ribbing. It almost NEVER looks good at the beginning. Oh - I like that yarn! That's gorgeous yarn. I love the colors. I used to have a bit of trouble on the heel, but that's when I first started sock knitting. I only knit short row heels at that time. I love the heel that you do, with the gusset. I find it to be much easier. 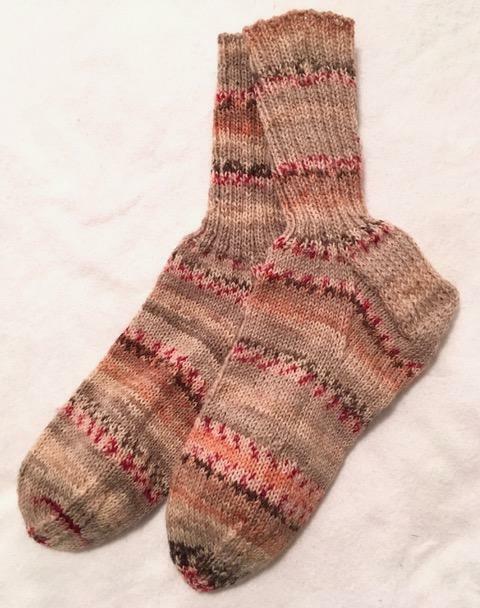 Sock knitting is so rewarding. Yours are so pretty!